“Any questions?” is how Saturday Night Live’s breakout sketch “Haunted Elevator” ends, and it’s an appropriate button, since many viewers seemingly came away with some. I can’t recall another sketch that has been as popular yet left so many people confused as to why they find it funny. The irony is that the answer is in the question: “Haunted Elevator” — or “David Pumpkins,” as it will forever be known — is confusing by design, looking for a sort of “wait, what! ?” laugh. Tom Hanks as David S. Pumpkins asks “any questions” because you should have them — and you do because it is a damn good sketch. The overall concept instantly reminded me, and everyone else, of “FBI Simulator.” It shares the same writers, Mikey Day and Streeter Seidell (with Bobby Moynihan joining for Mr. Pumpkins), and it uses a similar structure. It also reminded me of the old Old Spice guy, in that David Pumpkins is a character built on random absurdity — or as the Hollywood Handbook podcast would put it,”rando humor.” You’re meant to not get why he’s funny. The difference with “Haunted Elevator” and why it’s funnier than Old Spice commercials — or similarly wacky Skittles commercials, for that matter — is that visible confusion is built into the sketch. Day and Seidell, who also wrote last season’s breakout “Close Encounter,” are particularly adept at putting extraordinary characters in extraordinary situations by filling out the scenes with precisely calibrated straight people. 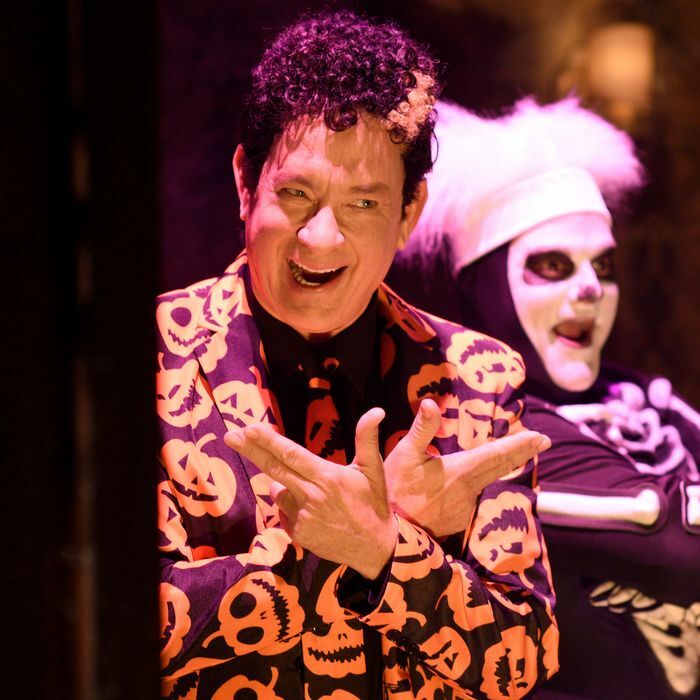 So while David S. Pumpkins’s appearances intensify, the sketch mostly heightens because of Bennett and McKinnon’s increased confusion. It all builds to a simple, expert conclusion, which may be the best thing about the sketch on a technical level. (On a less technical level, the best thing was Day and Moynihan’s dancing. It was very silly and nice.) Sketch writing in general struggles with endings, but it is something that especially plagues SNL. There is a joke that every SNL sketch ends with the cast members freezing and the audience clapping. This has improved a bit with digital shorts, since songs, for example, have built-in endings. But it’s nothing like Key & Peele, who — since they weren’t working on a weekly, high-pressure schedule — were masters of ending things on a big beat that both escalated and wrapped things up perfectly. Take “Prepared for Terries,” which is ridiculous all the way through, but cleverly pulls out to reveal it was a TSA training video. What makes the ending of “Haunted Elevator” so sharp is that the first thing Tom Hanks says is “I’m David Pumpkins and I’m going to scare the hell out of you” and that’s exactly what he does. The ending of him kneeling behind Bennett and McKinnon and asking for one last, horrifying time “Any questions?” is a perfect resolution of the sketch’s foreshadowing, a justification for the character’s confusing behavior, a validation of the internal logic of the haunted-elevator ride, and a last time to re-up a catchphrase. Then there’s Tom Hanks of it all. Though Hanks is generally considered one of the all-time great SNL hosts, he hasn’t hosted the show in over 10 years. Even older fans likely forgot how good he is at it. 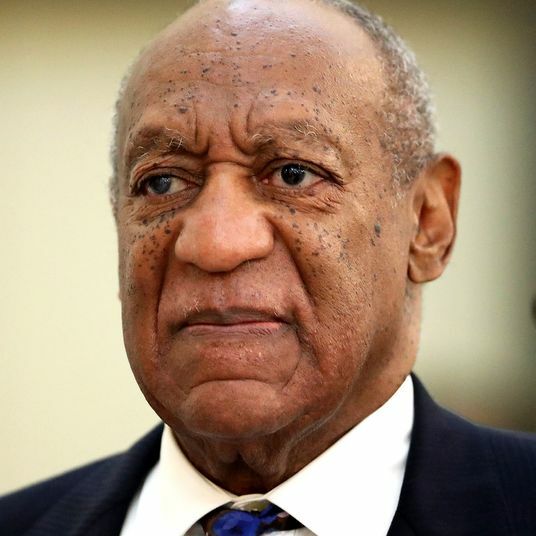 And in the time since his last appearance, Hanks has ascended to the role of America’s Dad, as the show itself mocked. To take this literally, imagine if last week your actual dad texted you a picture of himself dressed in a suit with spooky pumpkins on it, and a note saying “I’m going as David Pumpkins for Hallowen!” The gobsmacked feeling you’d have is part of the mixture that made this sketch such a phenomenon, since seeing Hanks act this way mirrors the disorientation at the center of the sketch. Still, there’s a difference between controlled bewilderment and, say, Adult Swim’s brand of gonzo ridiculousness, and it’s that difference that lends “Haunted Elevator” its wide appeal. Despite its random-seeming parts, the sketch makes sense on enough levels for it to succeed. This speaks to what is so special about SNL: timeliness, and the comedic power of tapping into the collective unconscious. Last week, with the final debate in the rearview mirror, people felt like Halloween week could be a sort of respite. Hopefully, it would be a brief window of fun, silliness, and childishness before we faced the horrors of the real world again. As inane as David S. Pumpkins may have seemed when Day, Seidell, and Moynihan pitched it Monday night, he was exactly what we all needed come Saturday. Especially for anyone still in search of a costume idea.